Presenting Waterfire Saga #1 Deep Blue by Jennifer Donnelly. After the vast reaches of outer space, the next spot that occupies on the list in terms of mystery and innumerable possibilities are the water bodies of Earth. This, plot based on myths of the sea and especially if done right can prove to be quite the intriguing reading experience. This is a mer-folk tale with the myths of old in the mix and I daresay made me remember of the children's Barbie movie, The Pearl Princess. Too childish, for you all maybe but I love watching them. Jennifer Donnelly weaves an intriguing tale of adventure, world's end, strong friendship and of the merpeople. Coupled with a gorgeous cover and strong characters, and a beautiful trailer, you definitely shouldn't give it a miss. Although the first half of the book is much more stronger than the second half. 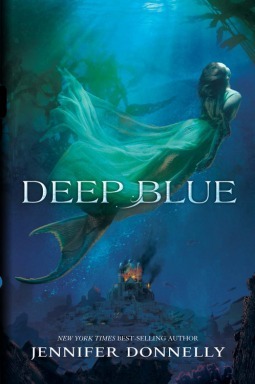 But I liked this book way better than the other mermaid centered stories I had previously read. The Princess Seraphina is a very likable character. She is strong willed, very much opinionated and is quite the worrier. With the added responsibility of being a royal the only child of her mother, and the future Queen of the kingdom and her coming nuptial with Prince Mahdi. Well she is anxious and developed some self-esteem issues. Add to it, she has nightmares every night of the coming of a great evil and clues in to her own importance in the circumstances. Being able to explore the world from her perspective and experiencing all the joys and the hardships she experiences truly make her shine. Can't say much about Mahdi yet but being the first book of the series, Deep Blue lays the groundwork for a great many strong characters and a fantastic plot. Definitely Sera and Neela's friendship was definitely one of the great things about this book. All that aside I would have liked to know more about Sera and Mahdi and the second half to hold high like the first half, which doesn't happen. So hopefully that will come to pass in the future books of the series. Given the consideration, this quite possibly a very interesting read and I am eager to read about what happens next and hope some of out burning questions be answered in the next one. "Mermaids & Mythology. Deep Blue proves to be quite the sensational journey"